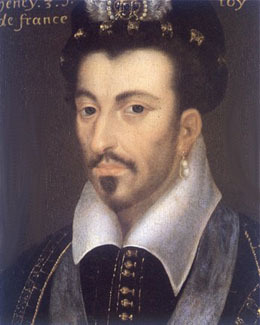 Henri III, King of France, third son of Henri II and Catherine de Medici, was born at Fontainebleau on the 19th of September 1551, and succeeded to the throne of France on the death of his brother Charles IX in 1574. In his youth, as Duke of Anjou, he was warmly attached to the Huguenot opinions, as we learn from his sister Margaret of Valois; but his unstable character soon gave way before his mother's will, and both Henri and Marguerite remained choice ornaments of the Catholic Church. Henri won, under the direction of Marshal de Tavannes, two brilliant victories at Jarnac and Moncontour (1569). He was the favorite son of his mother,and took part with her in organizing the massacre of St. Bartholomew. In 1573 Catherine procured his election to the throne of Poland. Passionately enamored of the princess of Condé, he set out reluctantly to Warsaw, but, on the death of his brother Charles IX in 1574, he escaped from his Polish subjects, who endeavored to retain him by force, came back to France and assumed the crown. He returned to a wretched kingdom, torn with civil war. In spite of his good intentions, he was incapable of governing, and abandoned the power to his mother and his favorites. Yet he was no dullard. He was a man of keen intelligence and cultivated mind, and deserves as much as Francis I the title of patron of letters and art. But his incurable indolence and love of pleasure prevented him from taking any active part in affairs. Surrounded by his mignons, he scandalized the people by his effeminate manners. He dressed himself in women's clothes, made a collection of little dogs and hid in the cellars when it thundered. The disgust aroused by the vices and effeminacy of the king increased the popularity of Henry of Guise. After the "day of the barricades", (the 12th of May 1588), the king, perceiving that his influence was lost, resolved to rid himself of Guise by assassination; and on the 23rd of December 1588 his faithful bodyguard, the "forty-five", carried out his design at the château of Blois. But the fanatical preachers of the League clamored furiously for vengeance, and on the 1st of August 1589, while Henri III. was investing Paris with Henry of Navarre, Jacques Clement, a Dominican friar, was introduced into his presence on false letters of recommendation, and plunged a knife into the lower part of his body. He died a few hours afterwards with great fortitude. By his wife Louise of Lorraine, daughter of the count of Vaudémont, he had no children, and on his deathbed he recognized Henry of Navarre as his successor.